I set-up a nano reef in a Marineland Eclipse 6 system (6 gallon). It has been running for about a month now and the amonia is 0, nitrites 0, and the nitrates about 40 ppm. I have about 7 lbs of Indo. live rock, 1/2 inch of live sand, and I was using the standard filter that comes with the system, which has a carbon/floss cartridge and a bio-wheel. I also have a small power head in the opposite corner from the filter return, giving extra circulation. I have been reading that the bio-wheel can actually cause problems with nitrates and should be removed. I would like to get some other opinions. I have also read that I should take out the cartridge and put a small bag of carbon, and a small bag of phos-guard instead. In the tank I have a small royal dottyback, 3 astrea snails, 3 red legged hermit crabs, 3 blue legged hermit crabs, green star polyps, a brain coral and a leather coral. I replaced the light that came with the system to a power glo (T5), but I think it is only 8 watts (12 inch), not the 3-4 watts per gallons that is recommended. I would appreciate any advice on the system. I am wanting to get another small fish (if I can find one that gets along with the dottyback), and a small blood shrimp. 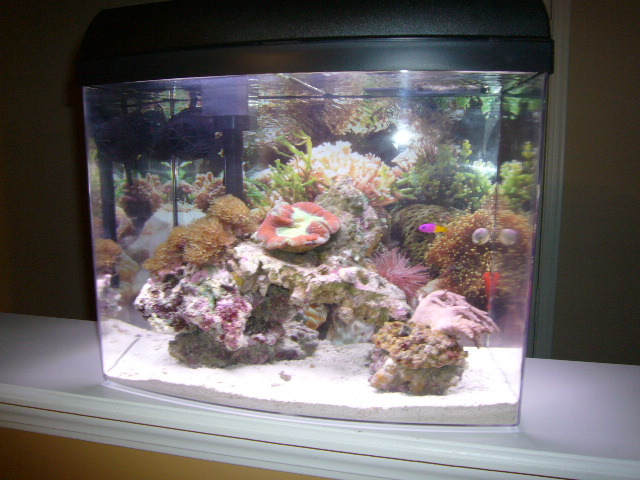 a few things, the biowheel and the filter floss are a no no in a reef tank.. they are nitrate factories. I would keep the carbon if you want and sure add phosban ( if you have a phosphate prob ) I didnt see a mention of a protein skimmer. if you dont have one, I suggest you do weekly water changes of ~50% so ~3g. that should bring those nitrates down to near 0 in a few weeks. the watts per gallon is not really a good measure of the lighting you need. all depends on what you want to keep. 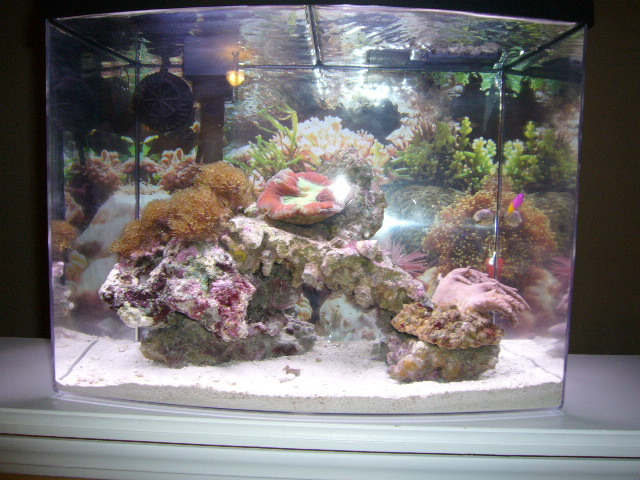 soft corals need less light then hard corals, specially sps. so you can keep so low light corals perfectly happy in there.. or you will need to upgrade it for harder to keep corals. blood shrimps are quite shy.. and you may not see him often.. unless he can't hide he he.. i suggest a cleaner shrimp instead.. they are usually not as shy and are still quite nice to look at. snails, add some more, usually we keep much less crabs, and alot more snails. look for nassarius snails. get 10 of those guys. maybe some cerith, margaritas maybe 5 each.. this will help clean up your tank. start with the nassarius.. they are tiny and get to all the places.. and eat like pigs. as for another tank make.. look for small gobies.. they are usually perfect nano mates and since they usually sit around, they are nice to watch. check out our sponsors, they have some great choises for you. also post your location so people can point you to the proper stores. Thanks for the info. Liv. I don't have a protein skimmer. There isn't any room with a small tank like this and with the hood, you can't hang one on the back, so I'm going to try without one and just do more water changes. With a small tank like this, water changes are very easy. The floss and the carbon are one piece (a plastic piece with carbon inside and the floss on top holding it in) so if I get rid of the floss I will have to get rid of the carbon. Should I get get some carbon and put it in a small bag and set it where the cartridge was in the filter? I will remove the bio-wheel. What causes phosphates? I don't have a test solution for that, should I be concerned? I just have testing for amonia, nitrites, nitrates, and PH. They came in a kit. phosphates can be caused by a few things.. but the main 2 are food and your tap water. as for the filter floss.. ya, dispose of it. unless you plan to wash it daily. and put carbon in a bag. Want to turn ten gallon into nano-reef!